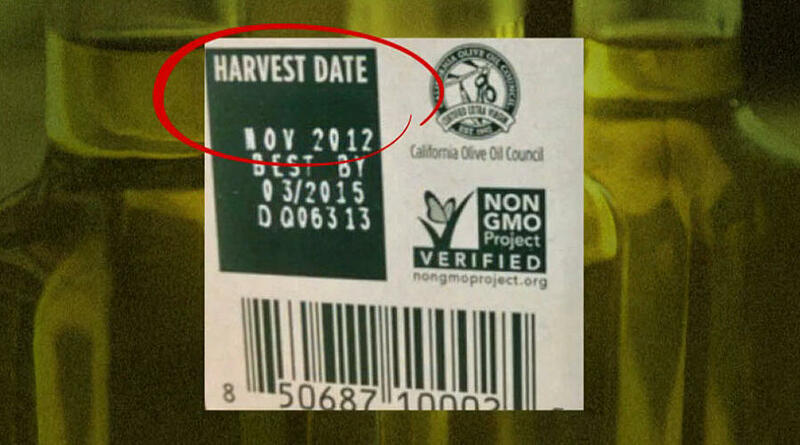 Many olive oil and food experts recommend that consumers check the back of the bottle for a harvest date. While it is a good idea to buy fresh olive oil, harvest date might not be the best criteria. Here's why. Most olive oil on the store shelves will not list a harvest date. Instead, most oils will have a best by date. What's the difference? Harvest date is when the olives were picked from the trees. The olive oil best by date is a calculation by the producer and bottler of the olive oil as to how long the olive oil will last under good storage conditions. Almost all olive oil that is grown in the northern hemisphere is harvested between October and December before the wet, cold winter months start. Olives for oil are harvested only once a year. There is really no difference between olive oil that is harvested a few weeks earlier or a few weeks later. It's all considered part of the same year's harvest. Different olive types in the same grove might be harvested at different times. The olives need to be picked at the right stage of ripeness -- not on a calendar. Another key reason why harvest date is not a good indicator of freshness is that some olive varieties "keep" for longer than others. For example, Picual tends to hold up longer than Arbequina. Unfiltered olive oil may last for a shorter amount of time than filtered olive oil. Finally, your olive oil is likely a blend of more than one olive variety; only the producer or bottler can tell you how long the oil is good for under proper storage conditions. Interestingly, olive oil that lists a harvest date will usually also list a best by date right under or next to the harvest date. In our survey, very few manufacturers list the harvest date on their bottles and consumers looking for a harvest date might be disappointed when they see how infrequently harvest dates are noted. So while shopping for olive oil, look for a best by date first and foremost to ensure fresh, quality olive oil. Olive oil, under the right storage conditions, is usually good for about 2 years after harvest. Once the bottle has been opened, the oil should be used within 2-3 months.